The passive solar greenhouse design allows you to garden year round without additional heating and cooling systems and costs. This greenhouse design has performed well under difficult weather conditions, including extreme temperature fluctuations, a somewhat cloudy winter, severe drought with high winds and very low humidity, and a fairly cloudy summer. Without the nighttime glazing wall removable insulation, the greenhouse did not freeze when temperatures dropped to -13F. With the use of glazing wall insulation, the greenhouse will remain above freezing under much more severe winter conditions. 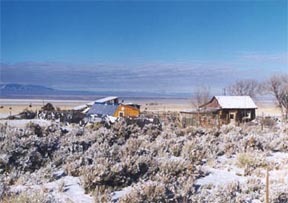 The greenhouse air may reach freezing temperatures under certain combinations of cloudiness followed by extreme cold during the winter. However, if you are growing frost-tolerant plants and/or using row covers, vegetable growth and production will continue uninterrupted throughout the winter. Soil temperatures never dropped below 50F. Various cold-season plants come to maturity, produced food, even germinated and grew from seed all late fall and winter. The cost to build this passive solar greenhouse is comparable to home greenhouse kits on the market. These kits usually presuppose that you are not going to use the greenhouse during the winter. A few only allow winter use with an additional heating system, however, since they lack an insulated foundation, heating costs would be high. Season extension systems I have tried were unable to give me the range and flexibility I desired, were too labor intensive, and were not durable, long-term solutions. I would not eat a ripe red bell pepper and certainly could not enjoy a ripe tomato at Thanksgiving. After researching many of the passive solar greenhouses written about as far back as the 1970s-including greenhouses built and operating year round in Arizona, Massachusetts, Washington, Pennsylvania, Wisconsin, California and New York-I designed a passive solar greenhouse that is adaptable for growing all year in a wide range of climates. Below is more technical information concerning the performance of this design. The average humidity between September and July, was 57 percent. During the winter, a time when humidity can be low in greenhouses, the average was 62 percent. The solar fan was hooked up in November and the water wall was only half finished until December, four days after the low of -13F. The shade cloth was fully employed from September through January and then rolled up. The lower two-thirds were put up in June. In February, the temperature in the top white plastic five gallon bucket at 4:30 p.m. was 75F. The temperature in the back metal pail was 88F. The next morning at 9 a.m., the temperature in the plastic bucket was 63F and in the metal pail it was 65F. Obviously, the metal pails store and release more heat. The "shade line" reached two feet into the north bed by May and came to a maximum of three feet into the north bed on the solstice. However, pole beans, lettuce, cucumbers, zucchini, and tomatoes are growing and producing well in the shady area. On the following graph, soil temperatures were the same in both the north and south beds until early May when I began to track them separately due to the shading of the north bed. The south bed is warm enough for melons and okra. Both beds� tomatoes, peppers and zucchini are growing well; both beds� eggplant is a little slow. Where the south bed would be much too hot for lettuce, heat tolerant varieties are producing well in the north bed. 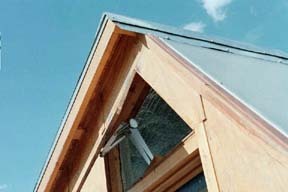 The solar vent opens mechanically by itself with increasing heat and closes when temperature drops. The passive solar greenhouse on a winter day.